Keyamo said that Obasanjo and the Peoples Democratic Party, PDP, were trying to deceive young Nigerians by telling them that there was no suffering during their tenure. Keyamo, a Senior Advocate of Nigeria, posted a front page of a national newspaper dated 2002 where Babaginda was quoted to have cautioned Obasanjo that “Nigerians are suffering” on his Twitter handle to drive home his point. 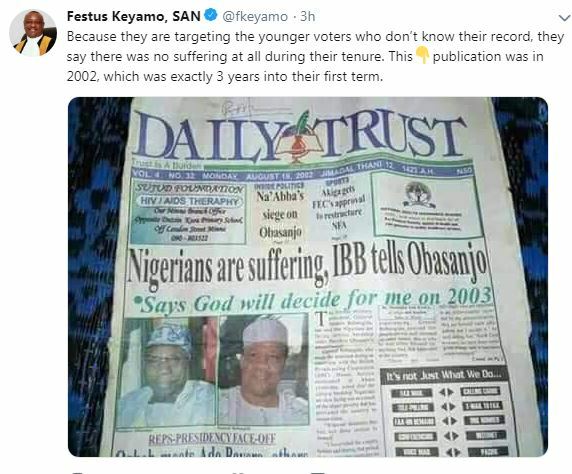 Keyomo tweeted, “Because they are targeting the younger voters who don’t know their record, they say there was no suffering at all during their tenure.